According to the folks at Allpar, a member of their site stumbled across and electronic copy of the 2014 Ram HD owner’s manual on the internet and included in the details was a mention of a 6.4L Hemi V8. Unfortunately, that information has seemingly been removed from the site in question but it was up long enough for someone to read parts of the 2014 Ram 2500/3500 owner’ manual and report back to the rest of the Mopar lovers at Allpar. The 6.4L Hemi V8 is expected to offer buyers a more powerful option over the 5.7L Hemi but with a much lower price point than that of the Cummins Turbo Diesel engine option for the Ram 2500 and 3500. 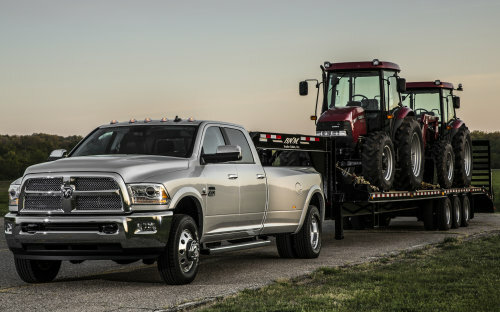 It is unclear whether or not the 5.7L Hemi V8 will continue serving as the base engine for the ¾ and 1 ton Ram trucks so this new mill could serve as the new base engine for the 2500 and 3500 or it could be a new optional engine for those who want a little more power but who also do not need the massive power of the diesel option – or the huge price increase that comes with the Cummins engine. It is also expected that the new 6.4L Hemi will serve as a “base” engine for the big Ram 4500 Chassis Cab rigs and that should equate to a lower entry price for the Ram 4500 which is currently only available with the expensive Cummins Turbo Diesel. The 6.4L Hemi V8 spent some time in the Mopar Performance catalog as a high performance crate engine before becoming a production engine in the Street and Racing Technology (SRT) variants of the Dodge Charger, Dodge Challenger, Chrysler 300C and Jeep Grand Cherokee. It is expected (almost guaranteed) that the 6.4L Hemi destined for the 2014 Ram 2500 and 3500 will be a very different engine from those high performance applications designed by SRT. Where the SRT 6.4L Hemi engine from those aforementioned performance cars offers 470 horsepower and 470lb-ft of torque, it is expected that the 2014 Ram HD will have a specially tuned version of the 6.4L engine that will be optimized for doing “truck stuff”. While the power output and the powerband (the RPM range at which the most power is made) are both ideal for high performance applications, tuning the 6.4L Hemi to offer torque at a lower engine RPM will make for a more capable truck while also likely improving fuel economy measures (as heavy duty trucks go, of course). We can almost certainly expect to see lower horsepower and torque numbers in the 2014 Ram HD than we do from the SRT vehicles but the tuning process for the Ram lineup will likely present a larger powerband for more consistent pulling and towing attributes. I would expect something in the area of 425 horsepower and 450lb-ft of torque with a massive amount of that torque being available just above idle. This engine has the very real potential to make the Ram Heavy Duty lineup the most powerful gas powered “big truck” in the US market, becoming a much more viable alternative to someone who needs more power than what is offered by the 5.7L Hemi but who doesn’t need the power of the Cummins – or the massive upcharge that comes with the diesel engine option. In addition to the new 6.4L Hemi V8, the leaked owner’s manual referenced a rear air suspension that has been rumored to be on the way for some time now. While the 2014 model year change rapidly approaching, it shouldn’t be very long before we have a full complement of information on the Ram 2500, 3500 and 4500 Chassis Cab.